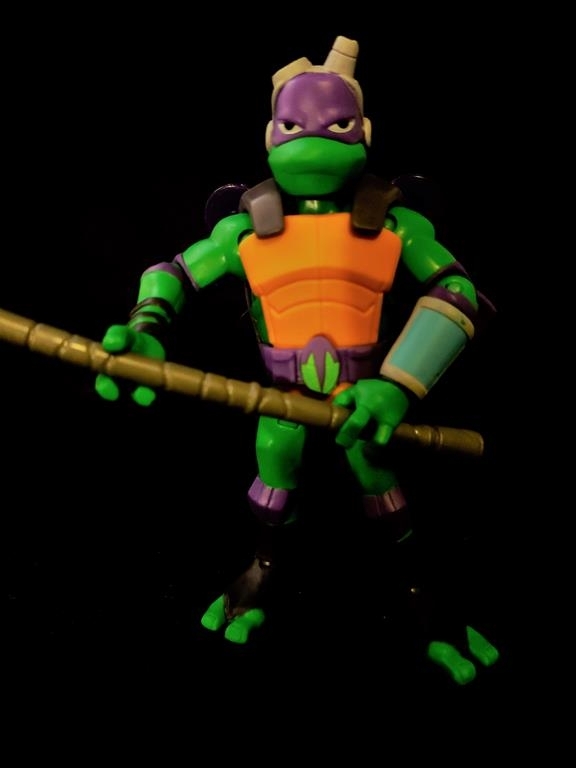 Donatello officially rounds out all the new Turtles from Playmates new Turtle line. 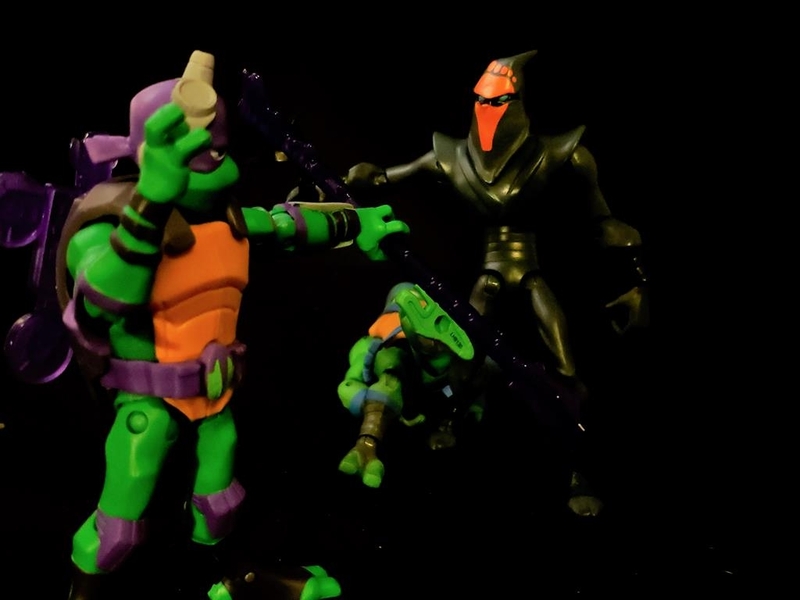 Yes I know these guys have been out for a while and I know this one is late but we did save the best for last. 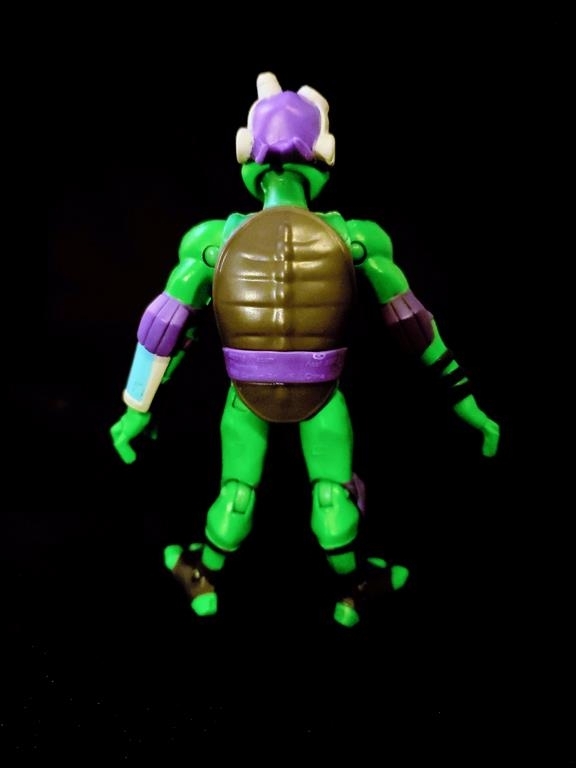 In fact, we plan to continue the reviews until Playmates changes things up again so once a month we will feature a new figure. 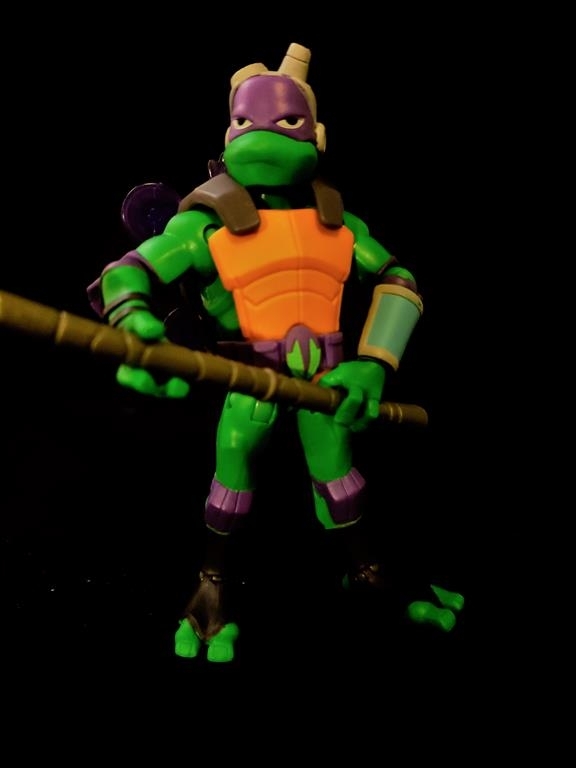 Overall Donatello was a fun figure to play with and yes, we play with our toys folks. 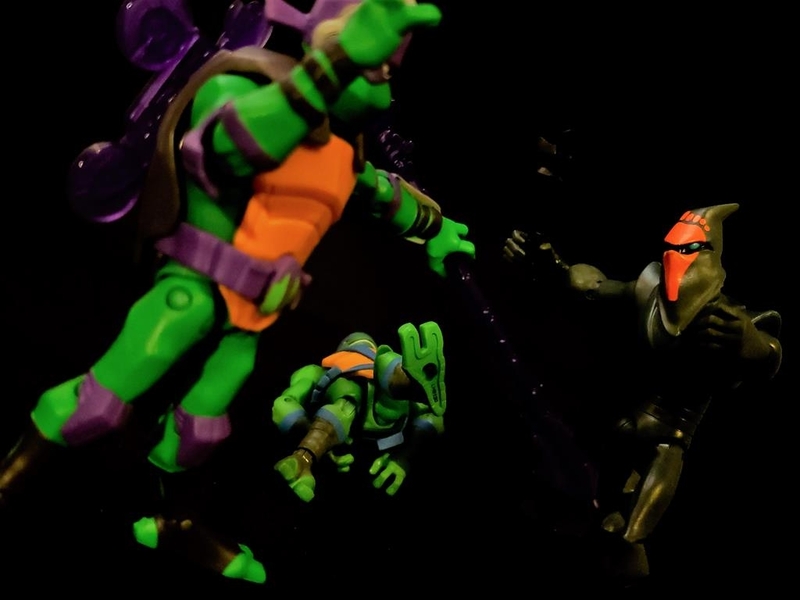 Afterall we are a site dedicated to action figures and collectibles. So with that lets jump right in. 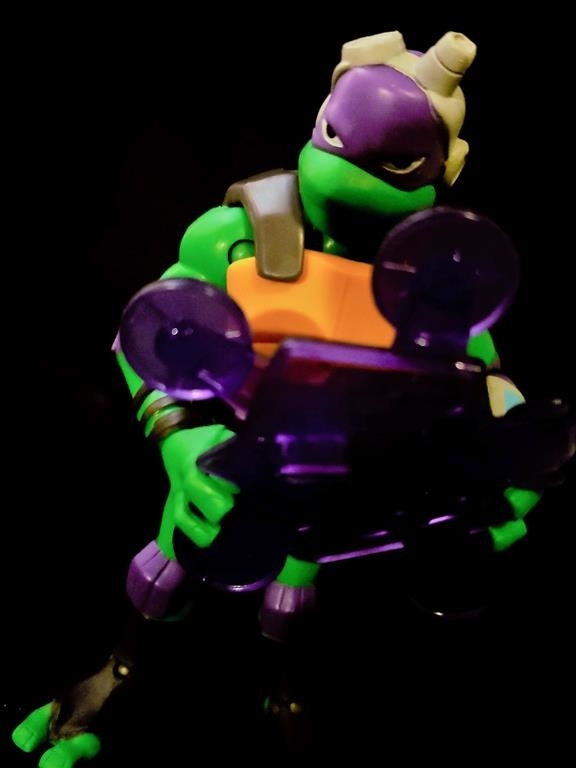 Donatello is the tech genius in the group and he comes with one of the coolest accessories so far; a turtle drone. He might not be the strongest but what he lacks in muscles he makes up for with his mind. 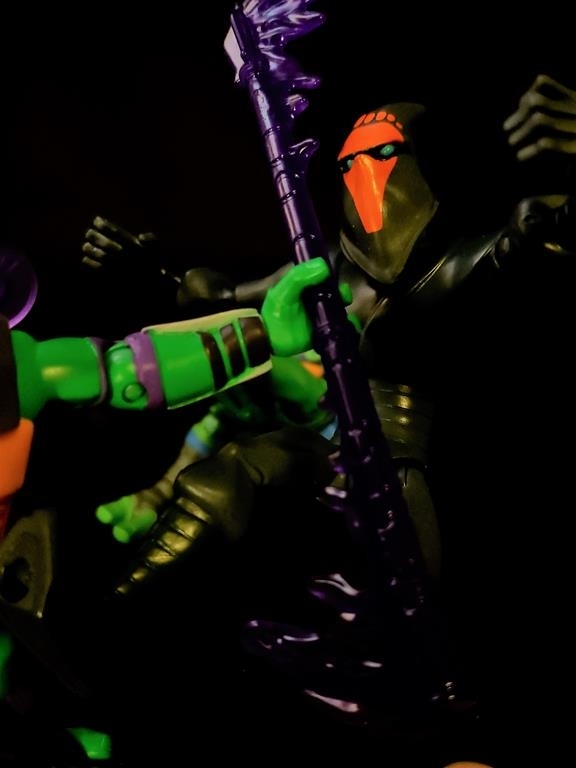 Personally I like the aesthetics of this figure. 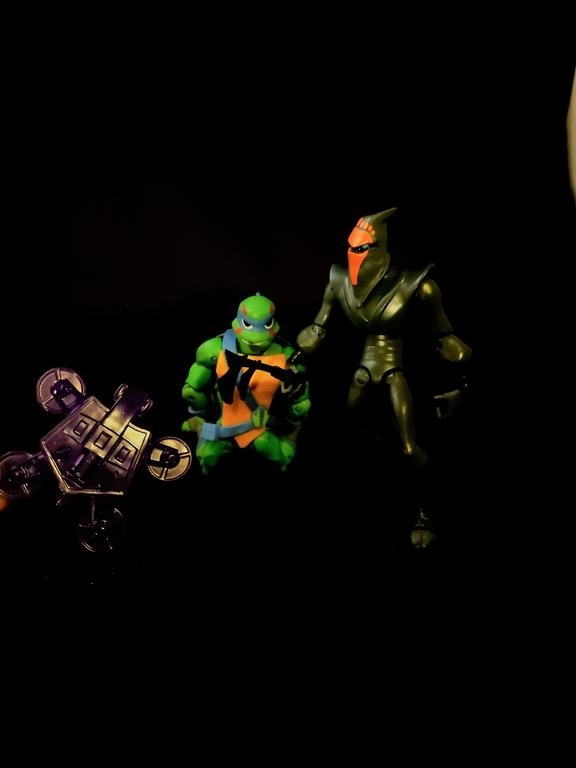 His articulation is on par when compared to the rest of the Turtles so we have no major change there. 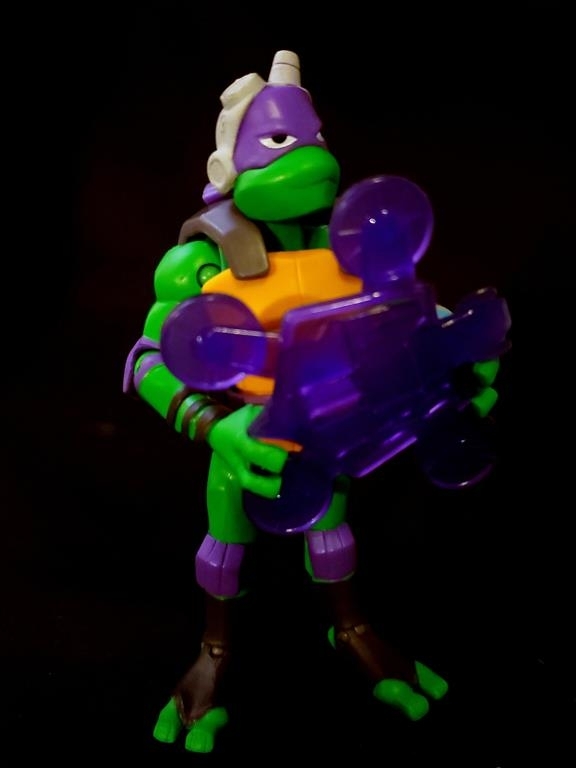 It boils down to his accessories and appearance. 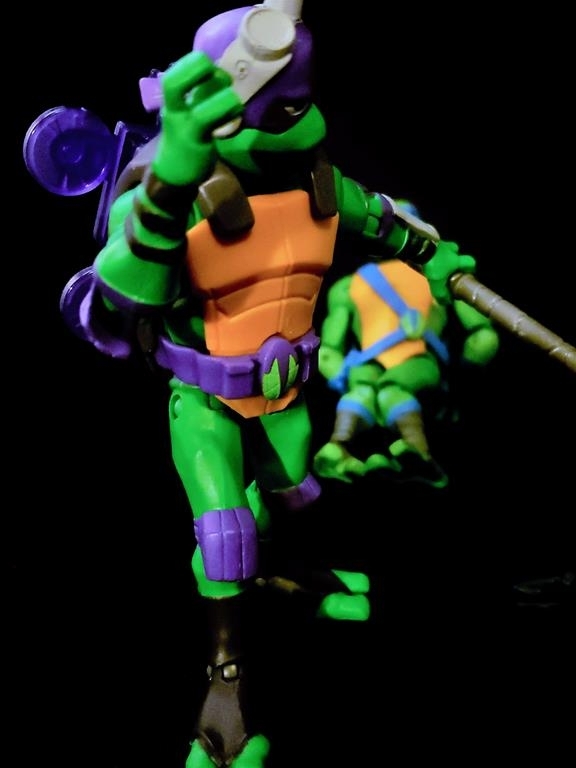 Donatello has popping colors and his paint apps were spot on. 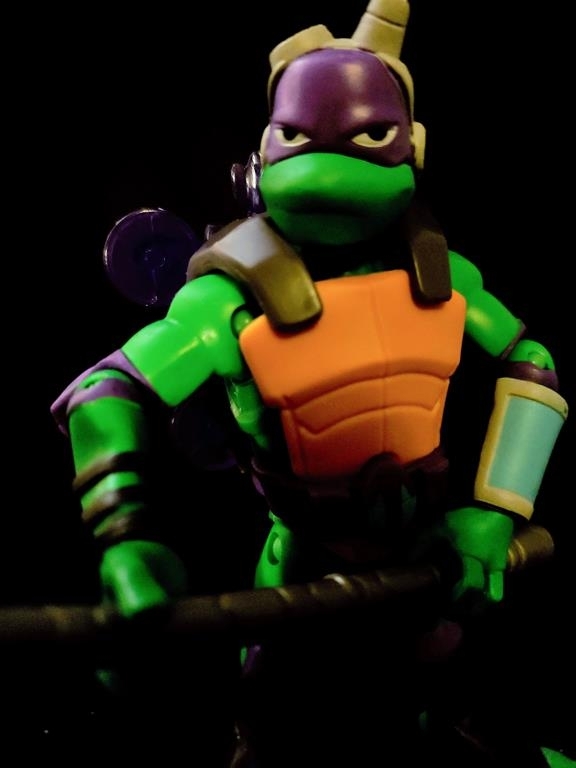 The overall quality of these figures have exceeded what we thought and Donatello is no exception. 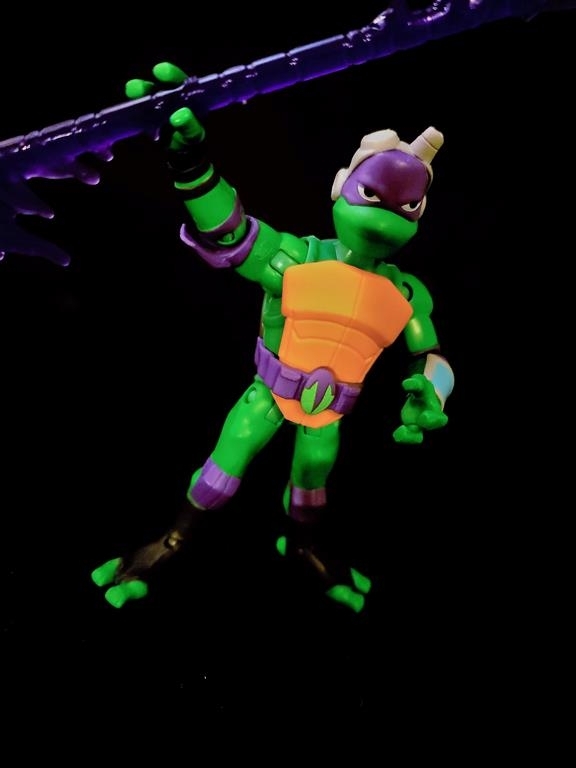 Maybe it’s the purple apps but he really stands out figure wise. 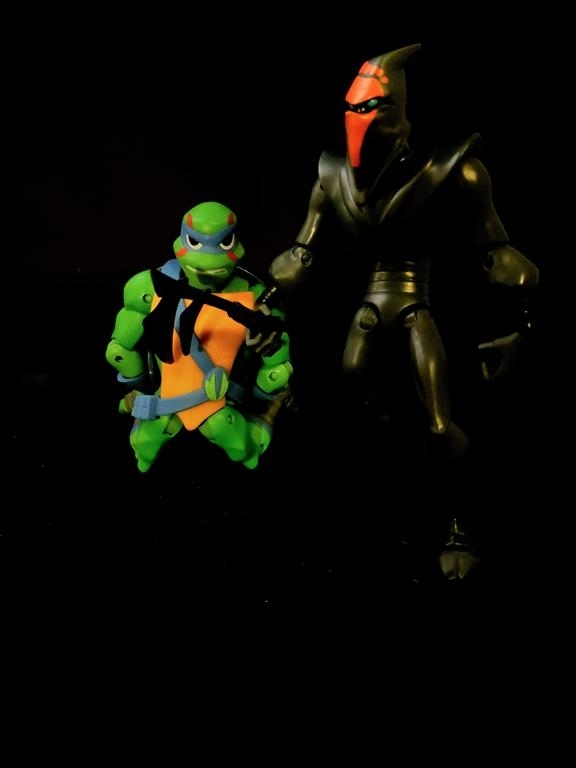 Plus as I mentioned, he comes with some awesome accessories. 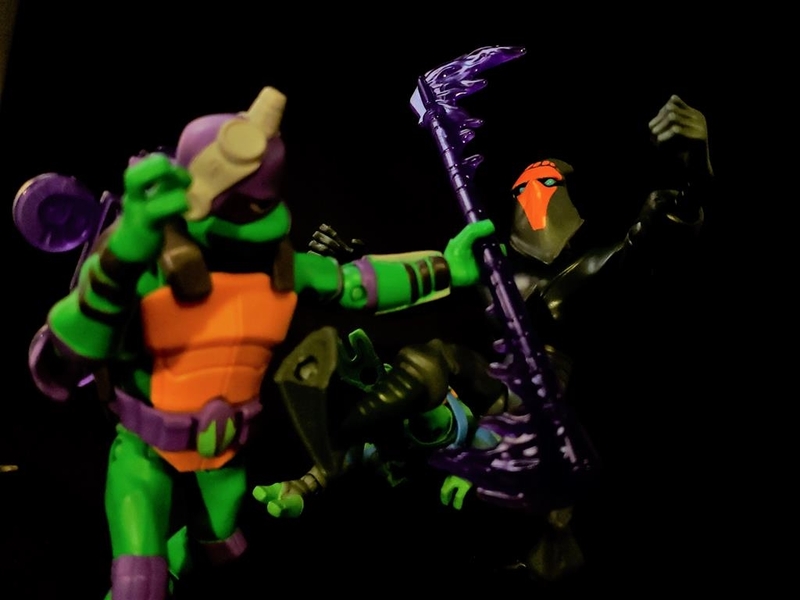 Not much can be said about the colors or the articulation so let’s move on to what the figure comes with. I for one love drones and his is no exception. 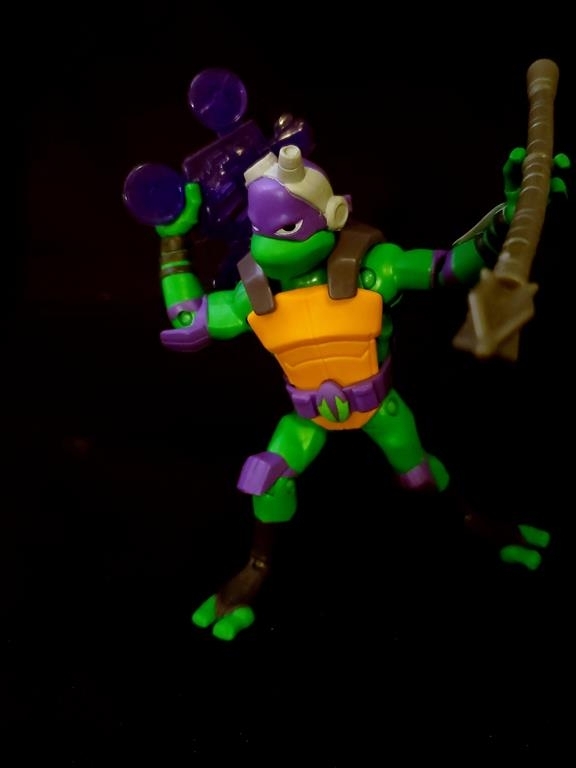 This accessory simply works for this figure. One of the best elements is you can store the drone on his back. All you need to do is line it up with the slots and there you go! 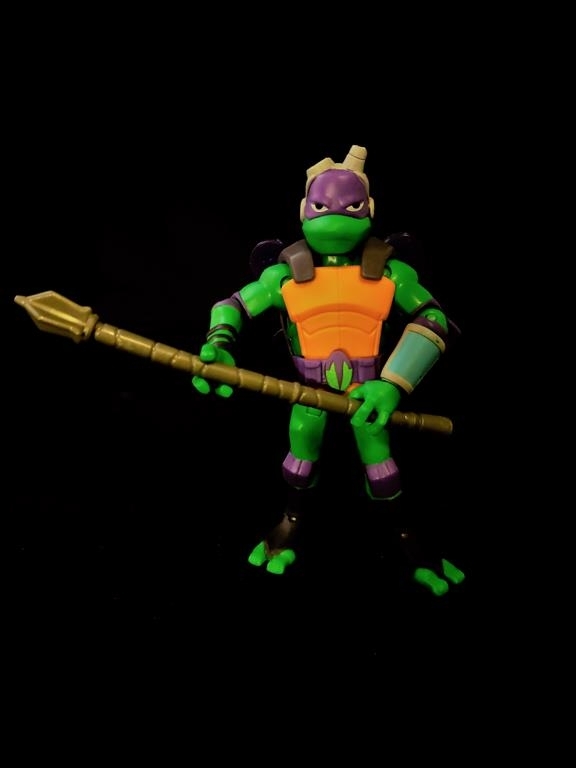 Besides the drone, Donatello comes with 2 bo staffs and 2 throwing stars. 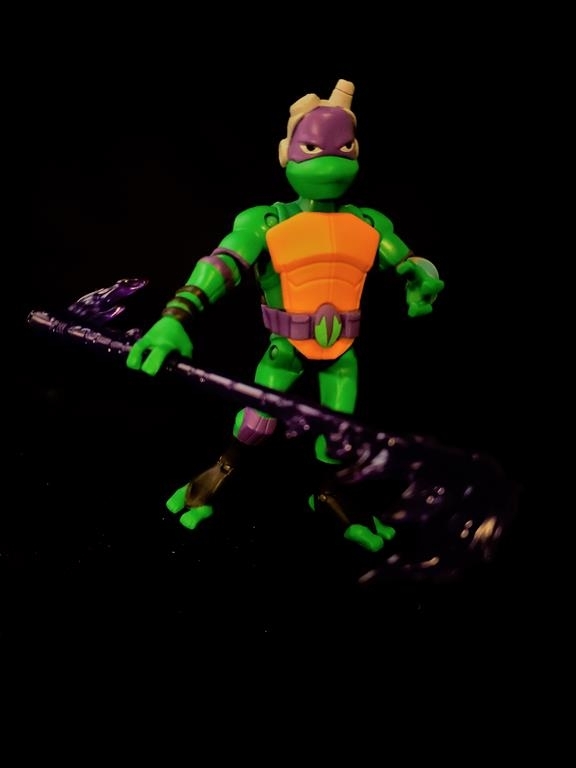 Remember this guy is indeed a Ninja so yes, he will have those throwing stars. 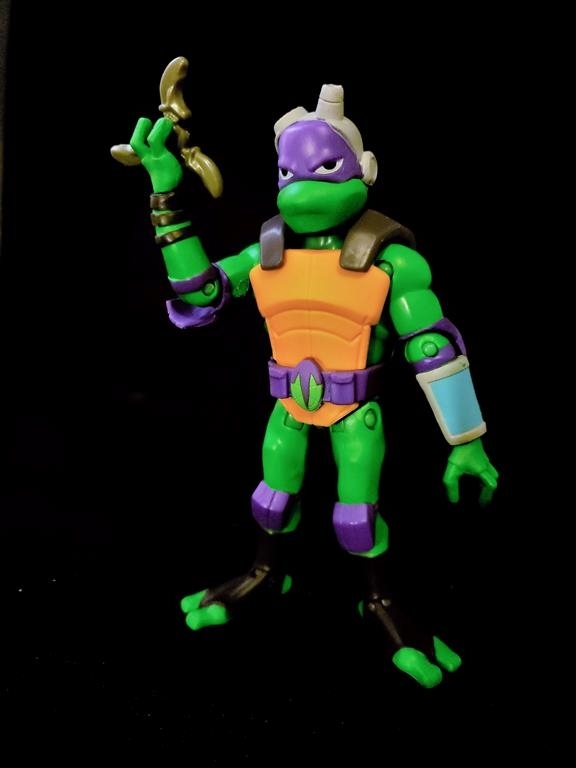 The attention to detail is spot on with his accessories and even the figure as a whole is good. 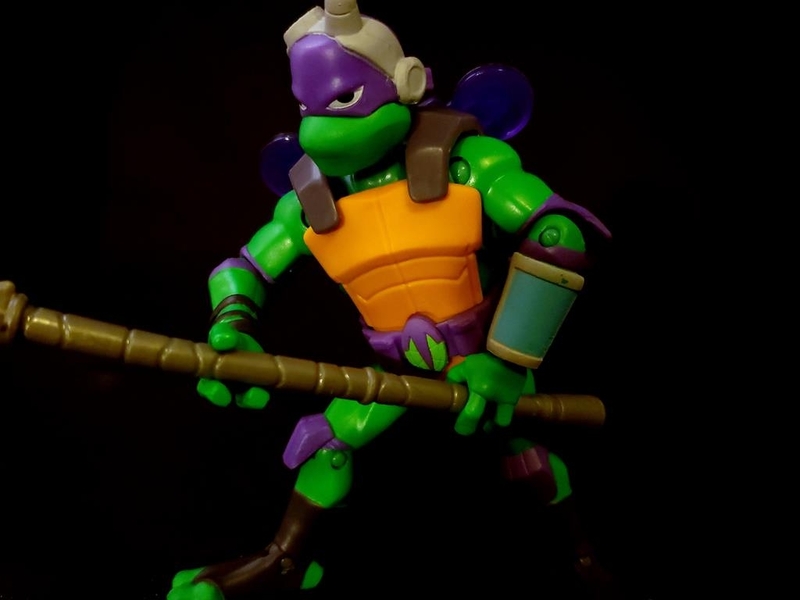 Playmates makes it a key point to pound home the attention to detail as they know fans of all ages want good, solid toys. 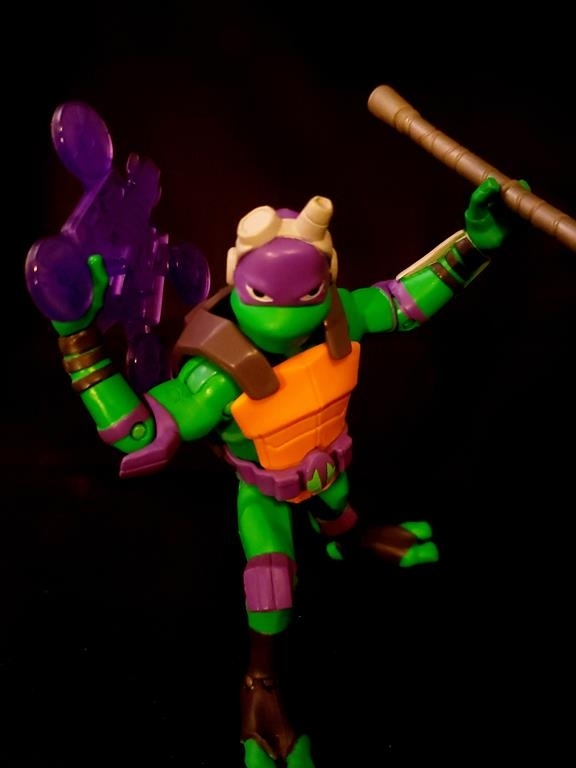 My overall feel for Donatello is joy. 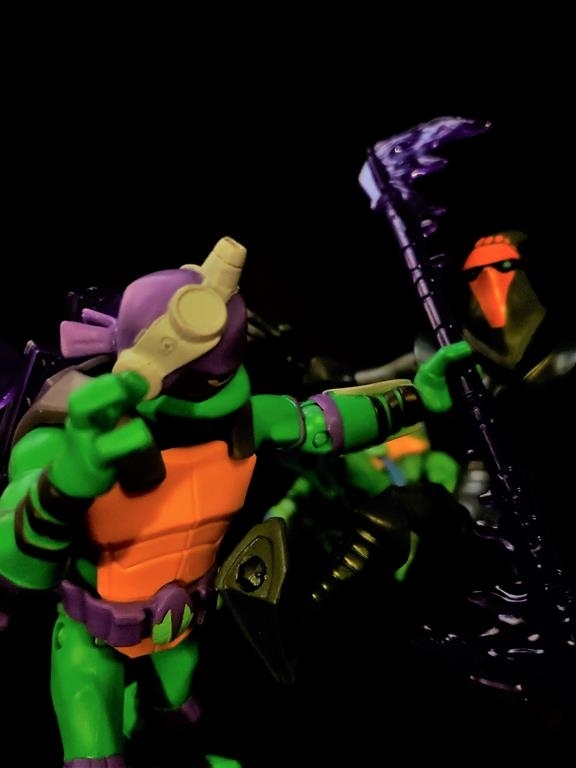 He is just a fun figure to play with. 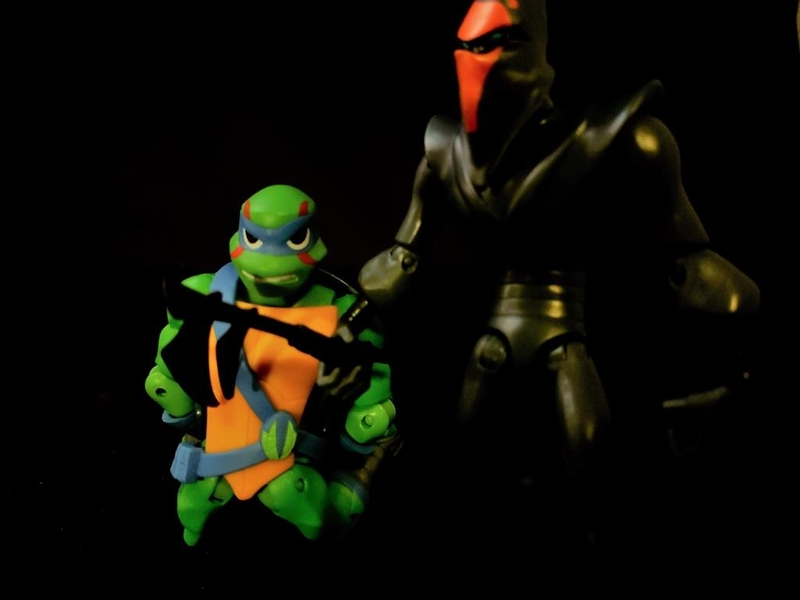 I do talk to other collectors who have yet to embrace the line and I tell them to give it a chance, you might be surprised. 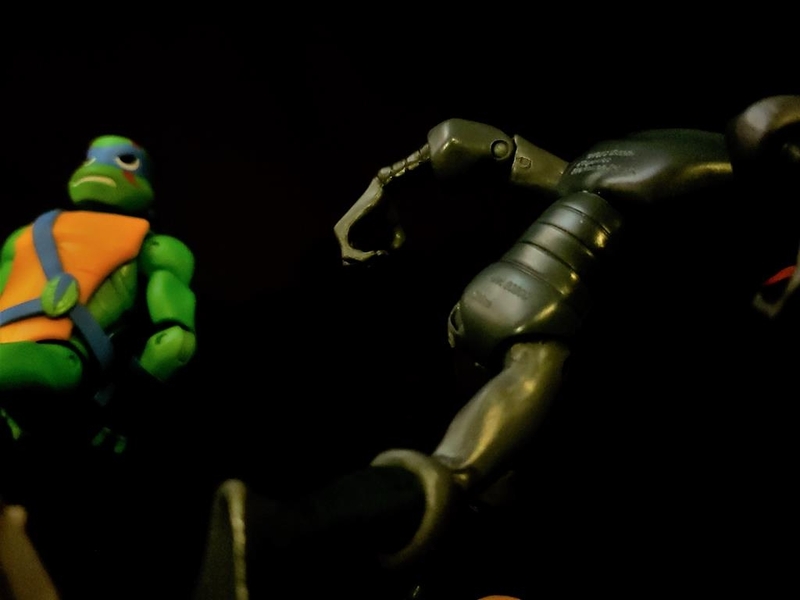 While the concept is different do not ignore these toys. 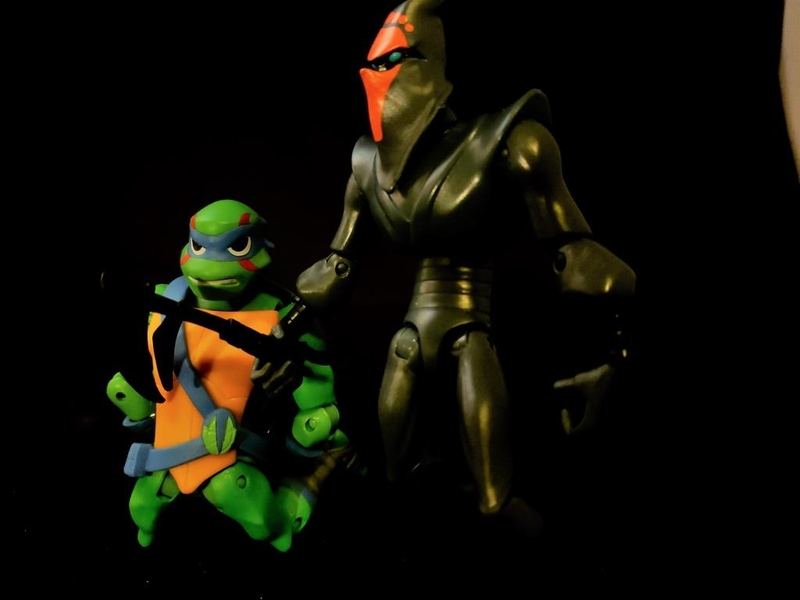 In 10 to 15 years, these figures will be lighting up the secondary market so why wait? Just get them all now! 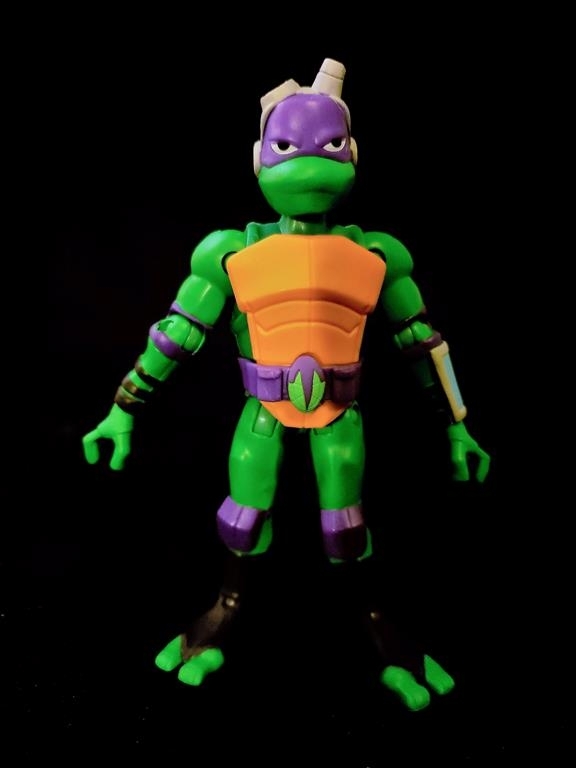 My overall rating on this figure is high, in fact I would say he is 4/5 and we don’t just throw that number around. One other thing, we are working a story line into the reviews as you can see below. We still have some work to do but we like to be different. 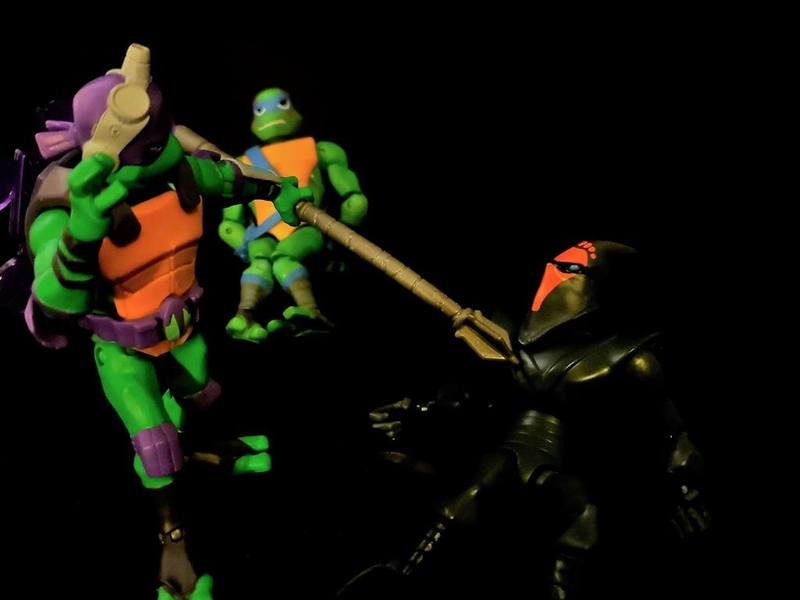 What you see below is Donatello rescuing Leonardo from the clutches of the Origami Ninja. 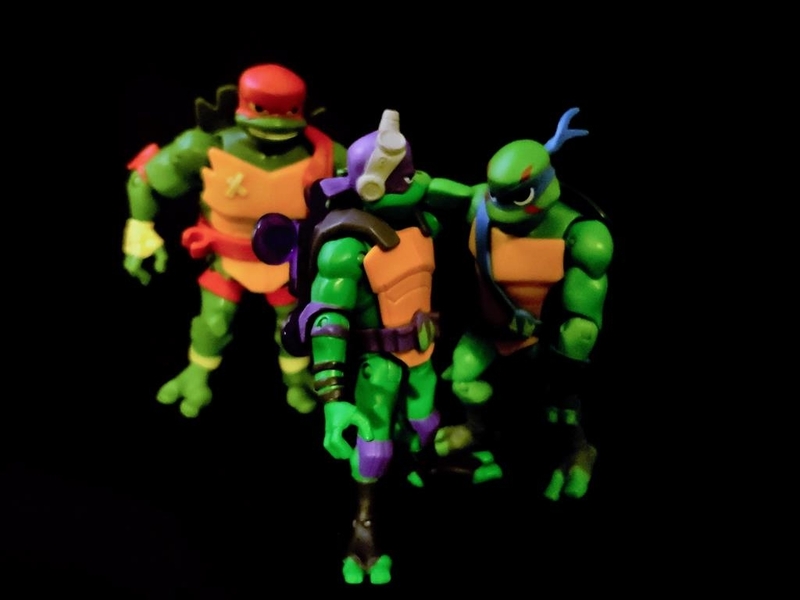 Those are some nasty Ninjas and the Turtles need to watch their backs as trouble is a brewing. I guess it’s the calm before the storm and who knows what will happen next so stay tuned! 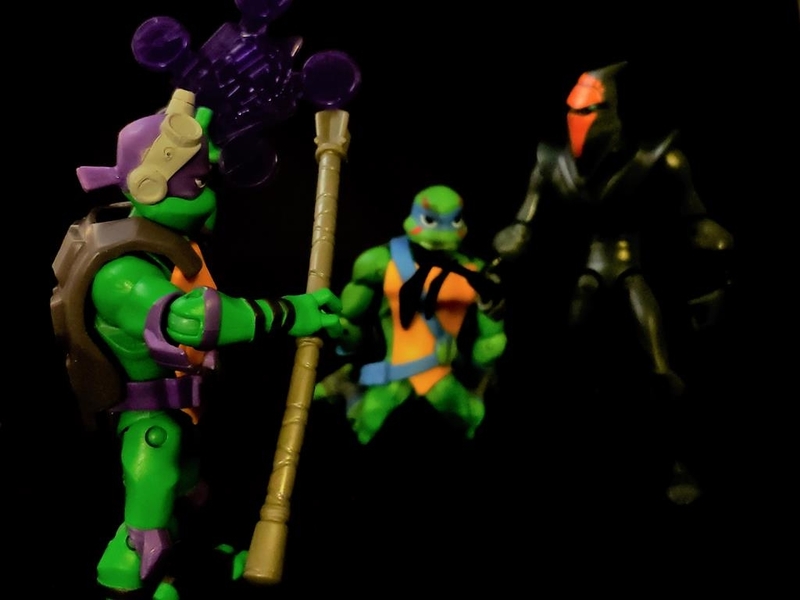 We have more Turtle reviews coming!